The Congressional Progressive Caucus (CPC) has unveiled its fiscal year 2019 (FY2019) budget, titled The People’s Budget: A Progressive Path Forward. It builds on recent CPC budget alternatives in setting the following priorities: near-term job creation, financing public investments, strengthening low- and middle-income families’ economic security, raising adequate revenue to meet budgetary needs while restoring fairness to the tax code, strengthening social insurance programs, and ensuring long-run fiscal sustainability. Figures A–C—which show the impact of The People’s Budget on debt, deficits, and nondefense discretionary funding compared with current law, the president’s budget, and historical averages—appear in the body of the report. 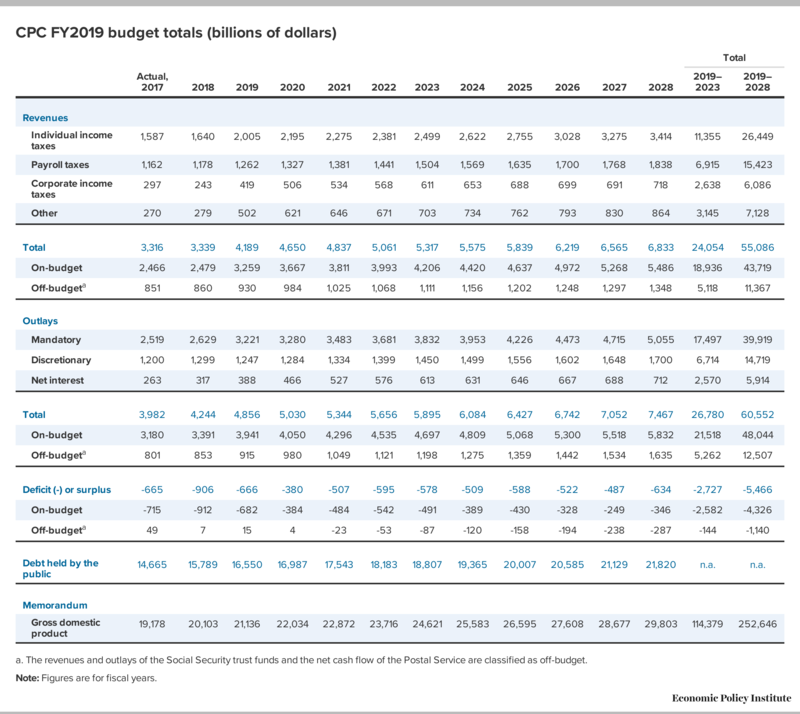 Tables 1 and 2, which detail the policy changes within the budget, and Summary Tables 1–4, which depict budget totals as well as comparisons with the current law baseline, appear at the end of the report. Make necessary public investments. The budget finances roughly $209 billion in job-creation and public-investment measures in calendar year 2018 alone and roughly $610 billion over calendar years 2018–2019.4 This fiscal expansion more than provides the amount of fiscal support needed to rapidly reduce labor market slack and restore the economy to full health. 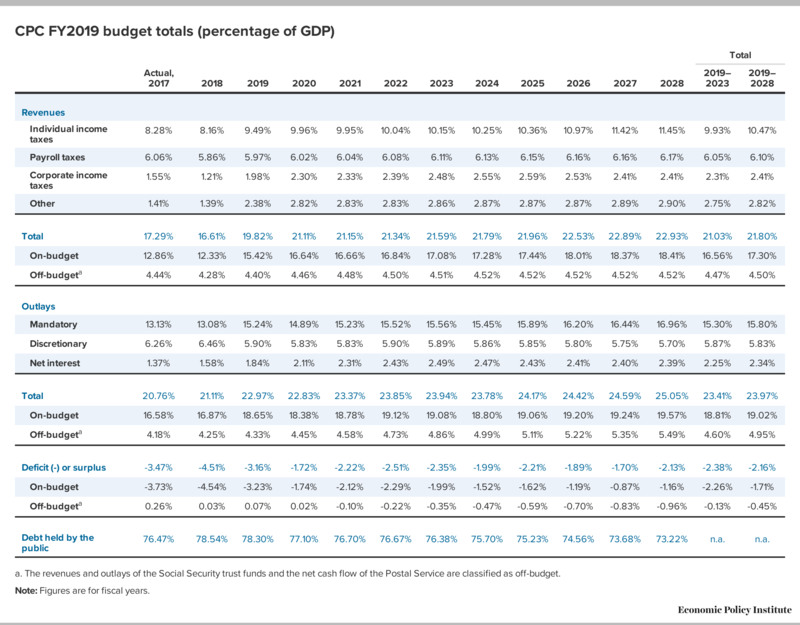 Furthermore, The People’s Budget also aims to hit more ambitious long-term public investment targets by returning nondefense discretionary spending to its historical average as a percentage of GDP by 2023. Facilitate economic opportunity for all. By expanding public investments, boosting public employment, and subsidizing affordable college, child care, and other programs for low- and middle-wage workers, The People’s Budget aims to boost economic opportunity for all segments of the population. Smartly cut spending. The budget focuses on modern security needs by repealing sequestration cuts and spending caps that affect the Defense Department but replacing them with similarly sized funding reductions that are less front-loaded and will allow more considered cuts. It ends emergency overseas contingency operation spending in FY2019 and beyond, and it ensures a slow rate of spending growth for the Defense Department for the remainder of the decade. Increase tax progressivity and adequacy. The budget restores adequate revenue and pushes back against income inequality with a revenue target of $10.9 trillion over FY2019–2028 to be raised progressively. Possible progressive revenue raisers to reach the target include adding higher marginal tax rates for millionaires and billionaires, equalizing the tax treatment of capital income and labor income, restoring a more progressive estate tax, eliminating inefficient corporate tax loopholes, levying a tax on systemically important financial institutions, and enacting a financial transactions tax, among other tax policies. Reduce the deficit in the medium term. The budget increases near-term deficits to boost job creation, but reduces the deficit in FY2019 and beyond relative to CBO’s current law baseline. After increasing near-term borrowing to restore full employment, the budget gradually reduces the debt ratio in the now-full-employment economy over time, reaching a key benchmark of sustainability (of a stable debt-to-GDP ratio during times of full employment). 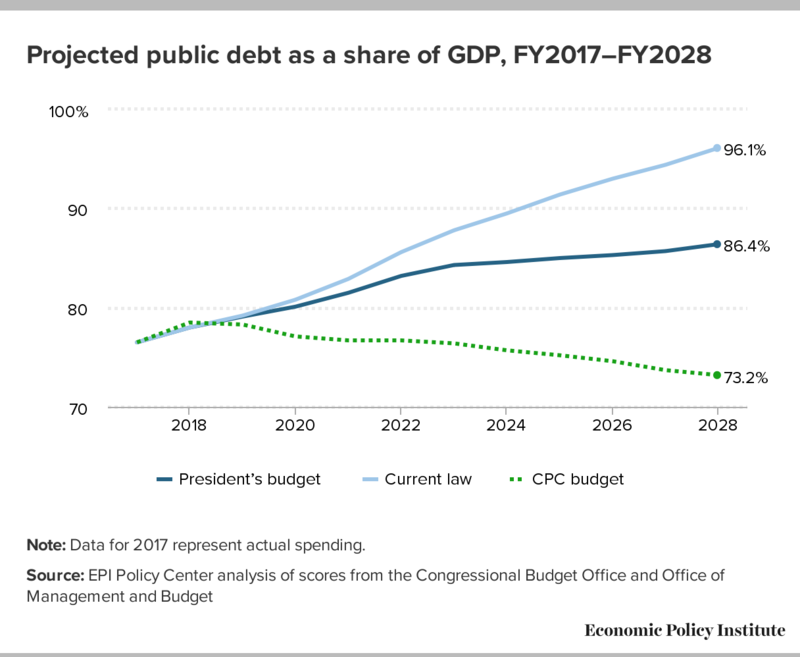 Relative to current law, the budget would reduce public debt by $6.8 trillion (22.9 percent of GDP) by FY2028. For the eighth year in a row, the Economic Policy Institute Policy Center (EPIPC) has provided assistance to the Congressional Progressive Caucus (CPC) in analyzing and scoring the specific policy proposals in its alternative budget and in modeling its cumulative impact on the federal budget over the next decade. The policies in CPC’s fiscal year 2019 budget—The People’s Budget: A Progressive Path Forward—reflect the decisions of CPC leadership and staff, not those of EPIPC (although many of the policies included in the budget overlap with policies included in previous EPI budget plans). All policy proposals have been independently analyzed and scored by EPIPC based on a variety of sources, notably data from the Congressional Budget Office (CBO) and the Office of Management and Budget (OMB). Hunter Blair, the author of this year’s analysis, would like to acknowledge former EPI Policy Center staff members Thomas Hungerford, Joshua Smith, Andrew Fieldhouse, and Rebecca Thiess, whose analyses of previous CPC budgets served as the template for this report. The People’s Budget is focused on both short- and long-term economic objectives. In the short run, The People’s Budget targets a rapid and durable return to genuine full employment through the use of expansionary fiscal policy. In the long run, The People’s Budget pushes back on decelerating productivity growth by making necessary and sustained public investments. The budget was developed from the evidence-based conclusion that the present economic challenges of joblessness and sluggish wage growth are the legacy of the prolonged shortfall of aggregate demand that was the result of the Great Recession and its aftermath (Bivens 2016b). This prolonged period of depressed aggregate demand also explains the elevated budget deficits and the rise in public debt over the past decade. Further, much recent research indicates that aggregate demand is likely to remain depressed in coming years without an ongoing boost from policy (this hypothesis about chronic ongoing demand shortages is often referred to as “secular stagnation”) (Bivens 2017b). Labor market slack resulting from this prolonged demand shortfall is in turn exacerbating the decade-long trend of falling working-age household income and the almost-four-decades-long trend of markedly increasing income inequality. Moreover, since late 2011, contractionary fiscal policy (reduced government spending) greatly contributed to the ongoing slack in the labor market and stagnant earnings for most workers. While unemployment has hit welcome low levels in the past year, evidence for continued slack in the labor market can still be seen through the low labor-force participation rate, the high labor-underutilization rate relative to previous periods of 4-percent unemployment, and the low employment-to-population ratio of prime-age workers (ages 25–54) (BLS 2018a, 2018b, 2018d). Expansionary fiscal policy can help ensure a prompt and durable return to a full-employment economy, which will in turn spur rising wages. While fiscal policy has very recently become more expansionary, it was made so in unwise ways. The tax cut signed into law at the end of 2017 will give the lion’s share of its benefits to the top 1 percent of households when it is fully phased in (Bivens and Blair 2018). These households are not currently income-constrained in their spending, so boosting their incomes will do little to spur aggregate demand. Further, while the rise in discretionary spending made possible by the recent budget deal is welcome, its expansionary effect will be blunted if some of the extra spending is cut back through budget “rescission” (as threatened by the Trump administration) or if after the deal expires austerity is re-established. Accelerating and sustaining economic growth, promoting economic opportunity, and pushing back against the sharp rise in income inequality remain the most pressing economic challenges confronting policymakers. To directly address these issues, The People’s Budget invests heavily in front-loaded job-creation measures aimed not only at putting people back to work, but also at addressing the deficit in physical infrastructure and human capital investments. In stark contrast to the current austerity trajectory for fiscal policy, The People’s Budget substantially increases near-term budget deficits to finance a targeted stimulus program that would include aid to state and local governments and public works programs.6 These types of investments would yield enormous returns—particularly by reducing the long-run economic scarring caused by the underuse of productive resources—and raise national income and living standards. The People’s Budget also seeks to accelerate productivity growth through sustained public investment—in part through nearly $2.0 trillion of much-needed infrastructure investments through 2028 and in part through returning nondefense discretionary (NDD) spending to its historical level of 3.5 percent of GDP by 2023 and keeping it there. The People’s Budget would further promote fiscal responsibility and reach a sustainable public-debt trajectory by raising revenues progressively, exploiting health care efficiency savings, and maintaining the reduced spending trajectory of the Department of Defense (DOD). This means that worries that increased deficits in The People’s Budget would put upward pressure on interest rates are misplaced. Interest rate pressure is normally thought to stem from anticipated future budget deficits run while the economy is forecast to be at full employment. But in future years when the economy is at full employment, deficits will be smaller under The People’s Budget. More than 10 years have passed since the onset of the Great Recession in December 2007, but the economic context for The People’s Budget remains unequivocally tied to the recession for the following reasons. Growth in the 8.5 years since the recession’s official end has been too sluggish to restore the economy to unambiguous full employment. While the unemployment rate as of April 2018 stands at 3.9 percent (BLS 2018c), it likely overstates the extent of labor market recovery. The share of adults ages 25–54 with a job—which fell an unprecedented 5.5 percentage points (from 80.3 percent to 74.8 percent) from its peak to trough due to the Great Recession—is now (as of April 2018) still just 79.2 percent (BLS 2018b). Further, nominal wage growth still remains far below where it should be in an economy at full employment, and no durable uptick in this nominal wage growth has so far been seen. The slow pace of overall growth since the Great Recession ended can be entirely explained by the drag from fiscal policy since 2011. While fiscal policy during and immediately after the recession—particularly the enactment of the American Recovery and Reinvestment Act (ARRA)—was strongly expansionary and arrested the economy’s sharp decline, economic performance has since deteriorated largely because fiscal policy became increasingly contractionary starting in 2011. This turn toward fiscal contraction has largely been driven by the enactment of the Budget Control Act (BCA) of 2011, which cut and capped discretionary spending and established the automatic “sequestration” spending cuts that took effect March 1, 2013. Contractionary fiscal measures aside from the BCA—the expiration of the payroll tax cut in January 2013, the expiration of federal emergency unemployment benefits in December 2013, and two rounds of benefit cuts in the Supplemental Nutrition Assistance program—have also intensified fiscal drags (Bivens and Fieldhouse 2012). The sheer size of the contraction of government spending over the current recovery is unprecedented. If public spending in the current recovery had simply matched the growth trajectory of that of the early 1980s recession and recovery, spending would be at least $1.0 trillion higher now. When multiplier effects are taken into account, this level of spending would have induced a full recovery (Bivens 2016b). By prematurely pulling away from fiscal support, policymakers condemned the economy to years of unnecessarily depressed output, anemic growth, high unemployment rates, and large cyclical budget deficits (Bivens, Fieldhouse, and Shierholz 2013). 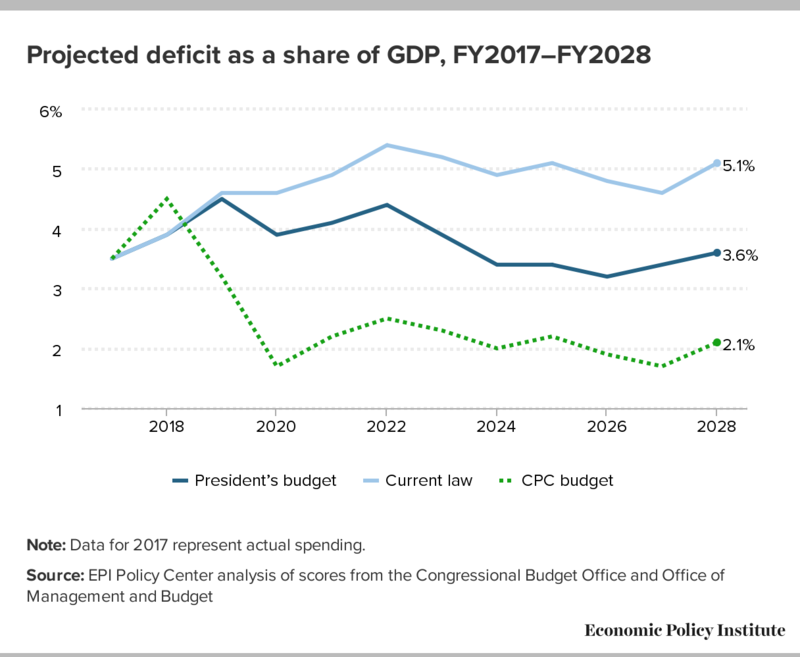 Instead of making recovery the priority, the Washington budget debate remained entirely focused on the one policy intrinsically at odds with spurring near-term economic growth: reducing budget deficits. And deficits will remain high as long as the economy is depressed. It is safe to say that by now the Budget Control Act has been an anti-stimulus substantially larger than the stimulus provided by the ARRA. The still-present slack in the labor market means that fiscal expansion could return the economy to genuine full employment. Targeting genuine full employment means more than just closing CBO’s measure of the output gap. Instead, fiscal expansion should go further and target a nominal wage growth that rises as fast as the sum of potential productivity growth and the Fed’s inflation target (Bivens 2015). Based on previous history, we would have guessed that a 4 percent rate of unemployment would have achieved this. But unemployment has dipped below 4 percent without an uptick in wage growth. This signals that policymakers should continue pushing unemployment down and the pace of job growth up until the nominal wage target is met. Even with the job-creation measures called for in The People’s Budget, this can only occur if the Federal Reserve does not raise interest rates relative to baseline. In fact, we believe that the Federal Reserve should not raise interest rates again until inflation actually appears in the data (Bivens 2016a). Using fiscal policy to boost aggregate demand is not only the key to achieving a durable return to full employment; it will also actually substantially finance itself and improve key metrics of fiscal health (notably the public debt-to-GDP ratio) in the near term, as the extra economic activity it spurs leads to higher tax collections and lower safety-net spending. A worrisome trend that has emerged fairly recently is that productivity growth has decelerated over the course of the recovery. This means that the benefits of aggressive fiscal policy to restore the economy to full employment and hold it there for a while could be large indeed. DeLong, Summers, and Ball (2014) and Bivens (2014) have shown the damage to estimated long-run GDP that is caused by an extended period of running the economy below potential. Reversing the damage already done by—and preventing further damage from—the slack in demand is a key reason why further economic stimulus is needed and why policymakers should be aggressive in pursuing an extended period of full employment (Bivens 2017a). Likewise, in both the short and long run, another way to stem the tide of decelerating productivity growth is through sustained public investment. The following sections describe the spending proposals and then the revenue policies in The People’s Budget (see Table 1 at the end of this report). The budget is modeled and all policies are scored relative to CBO’s adjusted April 2018 current law baseline (CBO 2018a). 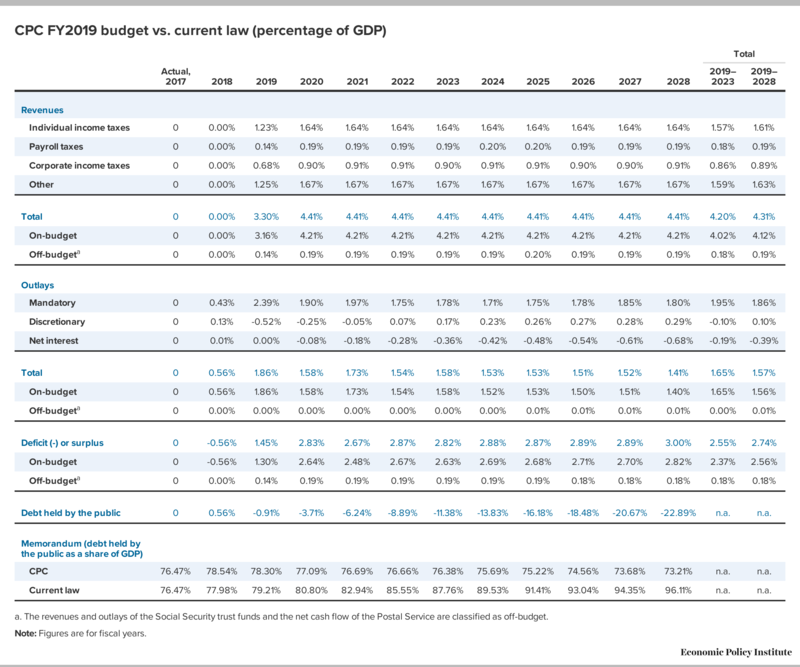 Individual policies and net budgetary impacts, including projected debt-to-GDP (Figure A), deficit-to-GDP (Figure B), and NDD budget authority–to–GDP (Figure C) ratios are compared with CBO’s current law baseline, as well as President Trump’s FY2019 budget. Note: Data for 2017 represent actual spending. Note: Supplemental spending includes war, disaster, emergency, program integrity, and 21st Century Cures Act. For the president’s budget, this figure uses CBO’s projections of GDP. Data for 2017 represent actual spending. Data for 2018 exclude Changes In Mandatory Programs (CHIMPs). The historical average excluding supplemental spending is 3.47%. The People’s Budget makes targeted investments in job creation and infrastructure spending aimed at rapidly restoring full employment, supporting a sustained recovery, and using public investment to accelerate productivity growth, while also making targeted cuts to reflect national priorities and improve efficiency in the budget. The People’s Budget ramps up overall spending in the near term to support economic recovery and pursue genuine full employment. The People’s Budget therefore heavily invests in stimulus measures over fiscal years 2018 and 2019 when economic support is most needed (see Table 2 at the end of this report).7 Spending then supports the recovery by ensuring that the mix of spending and revenue changes still provide a fiscal boost relative to baseline. In later years, increased spending largely consists of additional infrastructure spending to help meet estimated needs, as well as sustained increases in NDD spending that return NDD spending to historical averages by 2023 and sustain it there, rather than letting it fall to a 60-year low of 2.2 percent of GDP in FY2028, as projected under current law (see Figure C). As shown in Table 2, The People’s Budget finances $3.4 trillion in mandatory job-creation measures and public investments over FY2018–2028 ($3.3 trillion over FY2019–2028). A large share of the spending consists of sustained investments in infrastructure and child care subsidies. The People’s Budget expands and strengthens other key provisions of the social safety net as well. In addition to expanding funding for child nutrition programs, it also expands Supplemental Nutrition Assistance Program (SNAP) benefits by permanently reestablishing the American Recovery and Reinvestment Act (ARRA) levels of SNAP benefits and undoing SNAP cuts from the farm bill (adjustments totaling $65 billion in increased spending from FY2019–2028, as shown in Table 1). To ensure that federal civilian and veteran retirees are not experiencing a decline in their purchasing power, The People’s Budget indexes their retirement benefits to the Bureau of Labor Statistics’ experimental consumer price index for elderly households, or CPI-E, which more accurately reflects the buying patterns of American senior citizens. The change will result in additional outlays of $120 billion over FY2019–2028 (see Table 1). 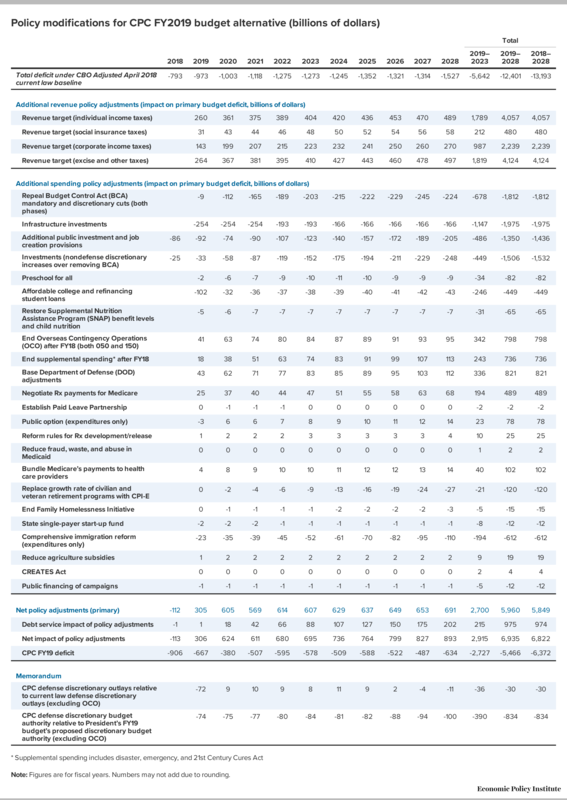 Other spending proposals adopted over FY2019–2028 in The People’s Budget include refinancing student loans and making college more affordable ($449 billion), investing in teachers and K–12 schools ($244 billion), and adopting President Obama’s previously proposed Preschool for All ($82 billion) and End Family Homelessness ($15 billion) initiatives. Despite the worrying trend of decelerating productivity growth, the United States has allowed its stock of public capital to decay. 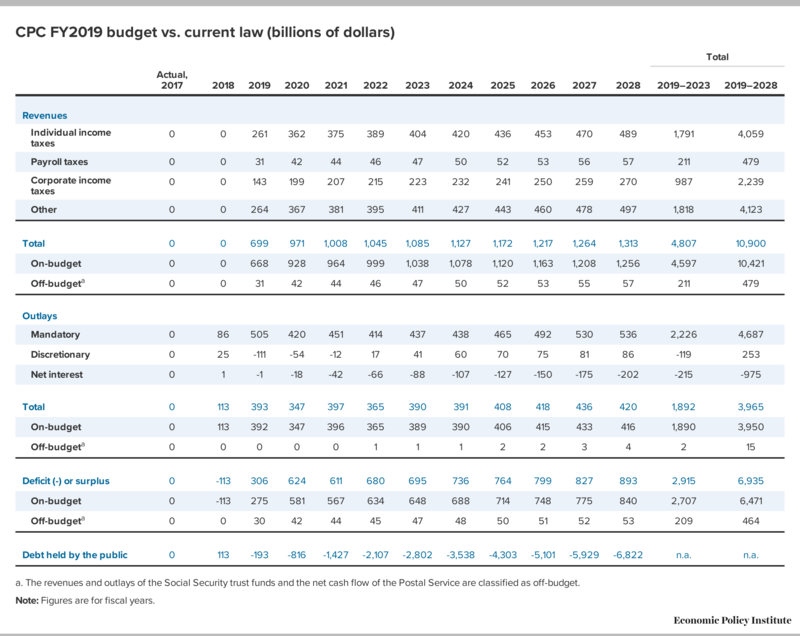 To reverse both of these trends, The People’s Budget includes a nearly $2.0 trillion investment in infrastructure over FY2019–2028 (see Table 2). Updating the estimates of the American Society of Civil Engineers for inflation, this infrastructure investment would cover roughly 90 percent of the infrastructure funding gap—the funding necessary to close the nation’s investment shortfall while offering a sustained, continuing dedicated source of funding specifically for infrastructure investments (ASCE 2016). In addition to these targeted job-creation measures, infrastructure investments, and public investments housed under the mandatory spending portion of the budget, The People’s Budget invests heavily in the core nondefense discretionary budget. The NDD budget houses a range of critical public investments in areas such as education, energy, basic scientific research, workforce training, and health. The Budget Control Act (BCA) enacted deep cuts to the NDD budget; repealing these cuts under The People’ Budget starting in FY2019 would result in an additional $881 billion over FY2019–2028 in needed NDD investments. The People’s Budget would also repeal the entirety of the discretionary and mandatory BCA spending caps and sequester cuts.9 In total, the CPC budget policy changes translate to a $1.0 trillion increase in NDD outlays over current law.10 Sustaining these investments is critical for building the country’s stock of public and human capital, a key driver of long-run productivity growth (Bivens 2012b). This boost to long-run productivity is vital given the worrisome trend of decelerating productivity growth. 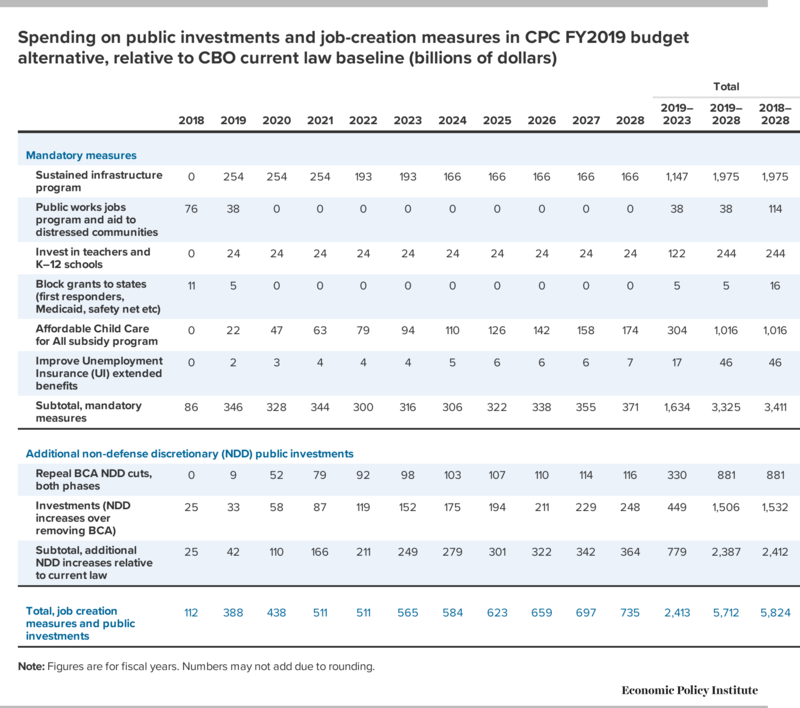 Public investments and job-creation measures in the mandatory and NDD budgets total $500 billion over FY2018–2019 (see Table 2), which, when combined with the other spending and revenue provisions within The People’s Budget, is more than enough fiscal support to fully close the remaining jobs gap. In addition to the nearly $2.0 trillion investment in infrastructure, mandatory public investment includes a $1.0 trillion investment in an affordable-child-care-for-all subsidy program over FY2019–2028. The NDD public investments as well as mandatory changes in The People’s Budget bring total job creation and public investments in The People’s Budget to $5.8 trillion above the current law baseline over FY2018–2028 (see Table 2).11 Critically, NDD budget authority would reach the historical average of 3.5 percent of GDP by 2023. By FY2028, under The People’s Budget, NDD budget authority is projected to remain at the historical average of 3.5 percent. In comparison, under current law, NDD budget authority is projected to decline to 2.2 percent by 2028. Meanwhile, the president’s budget would drastically reduce NDD budget authority, lowering it to 1.2 percent by FY2028 (see Figure C). This classification of federal spending is especially vital because much of it is needed public investment—purchases the government can make now that will boost employment in the short run but also provide lasting benefits, such as infrastructure and education. Under current law, such investment will soon reach its historical low as a share of GDP and continue to decline thereafter (Smith 2014b). The People’s Budget also proposes adjusting the pace of defense savings and finding other targeted and efficient savings in the budget. Over FY2019–2028, the CBO 2018 current law baseline includes a $798 billion reduction in DOD outlays from the BCA spending caps and sequestration cuts. The People’s Budget repeals these cuts and replaces them with similarly sized cuts that allow for a more gradual and considered approach to spending reductions. The budget provides $66 billion in budget authority for DOD overseas contingency operations (OCO) for FY2018—the same as the baseline and enough to fund full and safe withdrawal from Afghanistan—after which all OCO funding is ended. Responsibly reducing OCO spending would save $798 billion over FY2019–2028 relative to current law (see Table 1). The People’s Budget achieves savings outside of the Defense Department as well, many of which would build on the efficiency reforms already enacted in the Affordable Care Act. The budget implements the following policies (shown in Table 1): the addition of a public insurance option to Affordable Care Act health insurance exchanges (“Public option”); negotiation of Medicare Part D pharmaceutical drug prices with pharmaceutical companies (similar to current negotiation of drug prices through Medicaid); working to increase availability of generic drugs through the CREATES Act; reform of pharmaceutical drug development and patent rules; payment and administrative cost improvements (“Bundle Medicare’s payments”); and efforts to reduce fraud and abuse in Medicaid. In total, implementing these six policies would decrease budget deficits by an estimated $700 billion over FY2019–2028. Along with health savings, The People’s Budget would adopt a proposal from President Obama’s FY2017 budget to cut $19 billion from crop insurance subsidies (“Reduce agriculture subsidies” in Table 1) from 2019 to 2028—a proposal made necessary by the expansion of the subsidy program in the Agriculture Act of 2014. The U.S. tax code is failing in a number of dimensions. Tax receipts have been deliberately driven down to levels that cannot support current national priorities (let alone commitments to an aging population in an economy plagued by high rates of excess health care cost growth). Tax policy has increasingly exacerbated income inequality, and complexity within the tax code means that an individual’s or corporation’s tax bill can too easily depend on the abilities of one’s accountant. On each of these dimensions, the 2017 Republican Tax Cuts and Jobs Act (TCJA) made the tax code considerably worse (Bivens and Blair 2017). Previous versions of the CPC budget have reformed the tax code by enacting policies that would restore lost progressivity (so that effective tax rates reliably rise with income), push back against rising income inequality, raise sufficient revenue, and close inefficient or economically harmful loopholes. This year’s People’s Budget follows its past iterations by calling for a fair tax code that raises the revenue necessary for substantial public investments. However, the TCJA made significant changes to the tax code, which thereby affected the budget baseline that policy scores are modeled from. The recentness of the tax changes made scoring relative to the new budget baseline more difficult than in previous years without the use of a comprehensive microsimulation model, which was beyond the scope of our technical support for budget modeling. In lieu of a list of specific provisions, The People’s Budget sets a topline revenue target, to be raised progressively, that is large enough to pay for increased public investments and stabilize the debt-to-GDP ratio at full employment. Possible progressive revenue raisers mentioned by The People’s Budget to help reach this target should be familiar to readers of previous analyses. They include, for example, equalizing capital gains and dividends tax rates with the tax rate on labor income, ending tax breaks for offshore investment, ending the step-up basis for capital gains at death, imposing a financial transactions tax, and raising top individual income tax and estate tax rates, among other progressive tax policies. The People’s Budget specifies a topline revenue target of $10.9 trillion over FY2019–2028. This increases revenues as a share of GDP by 4.3 percent over FY2019–2028, from 17.5 percent under current law to 21.8 percent. (See Summary Tables 2–4.) Though higher relative to GDP than the previous post–World War II high of 19.9 percent in 2000 (OMB n.d.), this percentage remains small relative to that of other developed economies (even when state and local tax rates are taken into account). Moreover, aside from the United States, the great majority of advanced economies have increased their revenue-to-GDP ratios in recent decades (OECD n.d.), a logical extension of greater national wealth and aging populations. Although tax increases are contractionary under current conditions, the economic impact of a dollar of government spending (as shown by the fiscal multiplier) is about three times higher than the economic impact of a dollar of revenue in our estimates. Much of the revenue would be raised from upper-income households and businesses (which have relatively low marginal propensities to consume and thus particularly low fiscal multipliers even among tax changes) and used to finance high bang-per-buck job-creation measures. Therefore the relatively small fiscal drag from raising revenue would be more than offset by the other budget policies. We think that the CPC has specified a revenue target that can be plausibly reached through progressive reforms to the tax code. For more details on the amount that individual progressive tax policies could raise (keeping in mind that they are relative to a pre-TCJA budget baseline), readers should look to previous years’ versions of our analysis of the CPC budget. For example, last year the CPC budget raised revenues by $9.0 trillion from FY2018–2027 (Blair 2017). Likewise, the additional revenue lost by the TCJA amounted to $1.9 trillion over FY2018–2028 (CBO 2018b). For our analysis, we assume that the revenue is raised as a fixed percentage of GDP each year and that the split between individual income, corporate income, payroll, and other taxes matches their respective ratios relative to total revenues from last year’s CPC budget. To eliminate the slack in the labor market—a precondition for fast and equitable wage growth—The People’s Budget would finance enough in job-creation measures and public investments to roughly close the projected jobs gap and push the unemployment rate well below the current estimates of the “natural” unemployment rate in calendar years 2018–2019, provided the Federal Reserve accommodated the expansion. We believe that the current estimates of the economy’s “natural” rate of unemployment are clearly too high and that the U.S. economy could experience a sustained return to genuine full employment under The People’s Budget. If the full amount of increased outlays and other job-creation measures in The People’s Budget were passed and implemented in calendar year 2018, and the Fed did not actively try to neutralize their effect on the economy, we project that on net GDP would grow by an additional $252 billion (1.2 percent) and nonfarm payroll employment by 1.8 million jobs over calendar year 2018 relative to CBO’s current law baseline. Given that calendar year 2018 is two quarters gone, and given as well that some spending might create jobs only after an additional lag, the job-creation numbers for 2018 might come in below these projections, but this means that our estimates for 2019 would rise as activity and job creation spilled over into that year. In this analysis, we ignore these issues of potential lags and assume that the economic impact of The People’s Budget’s changes in outlays and revenues are reflected in the calendar year that these budget changes are made. Again, the only real concern this raises is that some of the impacts will be pushed from the end of 2018 into early 2019. Either way, The People’s Budget will both solidify and accelerate an economic recovery that is clearly progressing, but is still coming too slowly, and that too many policymakers are assuming to be inevitable and imminent. Specifically, The People’s Budget would increase spending on job-creation and public-investment measures by $209 billion in calendar year 2018 and $401 billion in calendar year 2019 relative to CBO’s current law baseline, for a total of $610 billion over calendar years 2018–2019.12 The associated boost to aggregate demand would be enough to substantially reduce labor market slack, taking into consideration minor economic headwinds from raising additional revenue (which has a countervailing contractionary effect, albeit relatively small per dollar). The People’s Budget would increase revenue by roughly $175 billion in calendar year 2018 and $767 billion in calendar year 2019, relative to current law.13 If these revenue increases were not so progressive, one could worry that they would actually reduce the deficit too rapidly in 2019 and would drag on growth. But because progressive revenue increases drag much less on demand growth, and because extra spending with large multipliers is sustained in 2019, we are confident that the economy can accept these revenue increases without slowing markedly. On net, The People’s Budget would boost GDP by $252 billion (1.2 percent) over calendar year 2018 relative to CBO’s current law baseline. Sustaining a fiscal boost for several years would be necessary to avoid creating a fiscal cliff demand shock. The People’s Budget does that even with reduced deficits by mixing very-high-multiplier spending increases with progressive revenue increases that drag much less on demand growth. These effects are projected based on the assumption that the Federal Reserve accommodates the fiscal expansion by not raising interest rates relative to baseline. While in our view the Federal Reserve should be accommodating to this expansion, recent rate increases make it plausible that the Federal Reserve would respond by raising rates. For more information, see Bivens 2016a. The author would like to thank colleagues Josh Bivens and Samantha Sanders for their help with this project. Special thanks are due to Thomas Hungerford, Joshua Smith, Andrew Fieldhouse, and Rebecca Thiess, authors of previous EPI analyses of CPC budget alternatives, for their assistance and guidance. Thanks also to CPC staff, especially Leslie Zelenko. Thank you finally to Krista Faries and Lora Engdahl for their helpful suggestions and excellent copyediting. All errors or omissions are solely the responsibility of the author. The Economic Policy Institute Policy Center has scored the policies proposed by The People’s Budget and modeled their cumulative impact relative to CBO’s adjusted April 2018 baseline (CBO 2018a). Table 1 at the end of the paper lists the major policy alterations to the adjusted April 2018 baseline and broadly separates policy proposals into two categories: revenue policies and spending policies. All policies are depicted as the net impact on the primary budget deficit (excluding net interest) rather than the impact on receipts and outlays. Note that some policies in the spending adjustments include revenue effects. Spending changes in Table 1 reflect outlays rather than budget authority. Debt service is calculated from the net fiscal change to the primary budget deficit, and the unified budget deficit is adjusted accordingly.14 The net impact of these policy changes on the budget, as well as relative to CBO’s current law baseline, can be found in Summary Tables 1–4. All figures in the tables and graphs are for fiscal years, but the text includes key calculations for calendar years. In some instances it is necessary to extrapolate from existing official or trusted scores (e.g., those from the Congressional Budget Office and the Office of Management and Budget) to adjust from a previous budget window to the current budget window. In these instances, the out-year scores are adjusted as a rolling average of the change in revenue or outlays for the last three years of an official score. Where available, revenue and outlay effects, as well as on- and off-budget effects, are extrapolated separately. All policy changes affecting Social Security are modeled as off-budget revenue and outlay effects and are reflected in the summary tables as such. Tax policies to reach the CPC budget revenue target are assumed to be implemented on January 1, 2019. Tax policies modeled from scores starting before FY2018 assume 75 percent of the revenue score for that year (the three quarters of FY2018 in calendar year 2018). More broadly, fiscal year scores are calculated as 25/75 weighted-average calendar-year scores where necessary. A fiscal multiplier of 1.4 has been assigned to government spending provisions, and a fiscal multiplier of 0.5 has been assigned to tax provisions. These are essentially rough median estimates from a range of studies. Some of these sources include Moody’s Analytics Chief Economist Mark Zandi (Zandi 2011), the International Monetary Fund, CBO, and the Council of Economic Advisers, among other forecasters (Bivens 2012a; CBO 2012; CEA 2011; IMF 2012). Best estimates for tax provisions’ multipliers demonstrate greater variance depending on how they are targeted to households or businesses more or less likely to spend an extra dollar of disposable income. Multiplier estimates of increased taxes on upper-income households (following the policy of the Obama administration) and corporations are lower, at 0.25 and 0.32, respectively, and The People’s Budget progressive revenue provisions likely fall into one of these two categories. The multiplier for pricing carbon would be somewhat higher, even taking into consideration the refundable rebate, and 0.5 is assigned as a conservative estimate for all tax changes. Policy adjustments for 2018 are calculated as 100 percent of FY2018 and 25 percent of FY2019 budgetary costs. All current policy adjustments for calendar year 2019 adopt a 75/25 fiscal year/calendar year split. Following the methodology in Bivens and Fieldhouse (2012), a multiplier of 1.4 is assigned to removing sequestration. These estimated multipliers are the “all else equal” effect of fiscal changes. Given that the Federal Reserve has been aggressively raising rates over the past year, they may well decide to actively neutralize the job-creation effects of any fiscal expansion. We believe this would be a mistake, but it is a reality. This consideration is why no one lever of policy—whether it’s fiscal policy, monetary policy, trade policy, labor policy, or anything else—can ever by itself solve all problems facing working Americans. Instead, a commitment to using all policy levers to boost low- and moderate-income households’ economic prospects is needed. The impact on the unemployment rate is calculated as an estimate using Okun’s rule of thumb. Specifically, the change in unemployment is projected by the percentage-point change in the relative output gap (actual output divided by potential output) divided by 2.0. Estimates for the change in nonfarm payroll employment are based on the percent change in GDP, using the methodology outlined in Bivens 2011. To calculate the effect on the share of prime-age workers (those between 25 and 54 years old) with a job (the employment-to-population ratio, or EPOP), we assume that 65 percent of the 1.8 million jobs created will go to this group, commensurate with their share of the total labor force. The resulting 1.15 million boost to employment for this group would push the prime-age EPOP by just under one full percentage point, restoring it to roughly the 80.1 percent that it averaged in the labor market peak of 2007. 1. Where policies in The People’s Budget have been carried over from previous CPC budgets, this paper draws accordingly from EPIPC’s analyses of CPC’s fiscal 2012, 2013, 2014, 2015, 2016, 2017, and 2018 budget alternatives: The People’s Budget: A Technical Analysis (Fieldhouse 2011); The Budget for All: A Technical Report on the Congressional Progressive Caucus Budget for Fiscal Year 2013 (Fieldhouse and Thiess 2012); The Back to Work Budget: Analysis of the Congressional Progressive Caucus Budget for Fiscal Year 2014 (Fieldhouse and Thiess 2013); The ‘Better Off Budget’: Analysis of the Congressional Progressive Caucus Budget for Fiscal Year 2015 (Smith 2014a); The ‘People’s Budget’: Analysis of the Congressional Progressive Caucus Budget for Fiscal Year 2016 (Hungerford 2015); ‘The People’s Budget’: Analysis of the Congressional Progressive Caucus Budget for Fiscal Year 2017 (Blair 2016); ‘The People’s Budget’: Analysis of the Congressional Progressive Caucus Budget for Fiscal Year 2018 (Blair 2017). 2. In previous budget analyses, we targeted an unemployment rate of 4 percent as indicating full employment. But unemployment has dipped below 4 percent without any upward momentum in wage or price inflation. In this analysis we instead target a return to previous peaks in the employment-to-population ratio of prime-age (25- to 54-year-old) workers. 3. These estimates are measured relative to CBO’s current law baseline. In our estimates the macroeconomic effect occurs at the end of 2018. Given that two quarters of 2018 have already gone by and given various lags in enacting policy, as well as lags in policy affecting the economy, it’s likely that this level of effectiveness could be reached in early 2019 instead. Regardless, if the job-creation measures in The People’s Budget were passed in coming months, there would be substantial near-term improvement in economic activity and jobs. 4. These estimates are measured relative to CBO’s current law baseline. This includes job-creation measures, public investments, nondefense discretionary spending increases, and repeal of Budget Control Act discretionary spending caps (see Table 2). 5. The People’s Budget apportions increases to the nondefense discretionary budget functions as follows: 15 percent for International Affairs (Function 150); 5 percent for General Science, Space, and Technology (F250); 5 percent for Energy (F270); 5 percent for Natural Resources and Environment (F300); 5 percent for Commerce and Housing Credit (F370); 5 percent for Community and Regional Development (F450); 15 percent for Education, Training, Employment, and Social Services (F500); 10 percent for Health (F550); 20 percent for Income Security (F600); 10 percent for Veterans Benefits and Services (F700); and 5 percent for Administration of Justice (F750). 6. The characterization of current fiscal policy as “austere” is eminently justifiable when comparing spending growth over the current recovery with spending growth in all other post–World War II recoveries—particularly when the size of the output gap at the trough of the Great Recession is taken into account. 7. This includes undoing nondefense discretionary spending cuts included in the Budget Control Act. 8. The proposed Emergency Jobs to Restore the American Dream Act of 2011 was included in the Budget for All, the Congressional Progressive Caucus’s FY2013 budget alternative. The jobs-creation package invests $113.5 billion in each of two years and was estimated by Rep. Schakowsky’s staff to support the creation of two million jobs (Fieldhouse and Thiess 2012). 9. The $881 billion is the additional NDD outlays that result from repealing both the BCA NDD caps and the BCA NDD sequester over FY2019–2028. 10. This value differs from the subtotal of additional NDD increases in Table 2 because of decreases in NDD spending under The People’s Budget resulting from ending supplemental spending for war, disaster, and emergencies. The value differences are particularly salient this year as NDD emergency budget authority totaled $102 billion for FY2018 since the most recent federal budget deal included a one-time disaster relief package. However, CBO’s budget baseline is required to grow the most recent discretionary appropriation at the rate of inflation, even when that appropriation is one-time emergency spending. We think it is safe to assume that emergency funding will not be historically large for the next 10 years, meaning this reduction in emergency spending in the CPC budget will not constitute a reduction in actual spending. 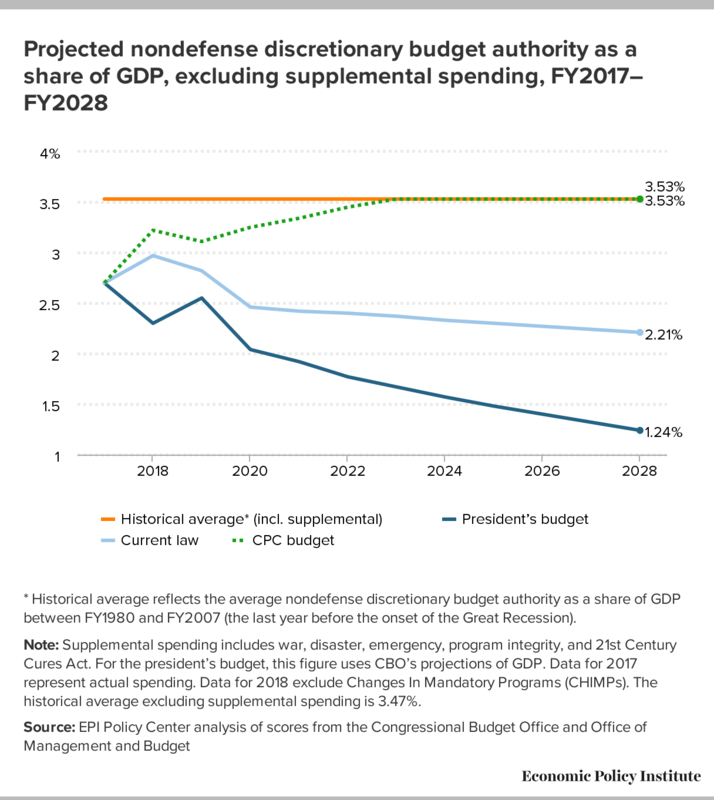 For context, CBO scored a policy alternative for providing emergency nondefense funding at the average historical amount over the budget window, which decreases the deficit by $577 billion over FY2019–2028 (CBO 2018b). In the CPC budget, NDD budget authority is increased gradually in order to reach historical levels of NDD budget authority by 2023 and is then sustained at historical levels for the rest of the budget window. The associated budgetary outlays can be seen in Table 2. 11. This includes undoing both phases of NDD cuts in the BCA. 12. These calendar-year increases are based on additional outlays of $112 billion in FY2018, $388 billion in FY2019, and $438 billion in FY2020, relative to CBO’s current law baseline (see Table 2). 13. These calendar year increases are based on net increases in revenue of $699 billion in FY2019 and $971 billion in FY2020 relative to CBO’s current law baseline (see Summary Table 3). 14. Debt service is calculated by CBO’s debt service matrix for the April 2018 baseline. American Society of Civil Engineers (ASCE). 2016. Failure to Act: Closing the Infrastructure Investment Gap for America’s Economic Future. Bivens, Josh. 2011. Method Memo on Estimating the Jobs Impact of Various Policy Changes. Economic Policy Institute, November 2011. Bivens, Josh. 2012a. “Claims about the Efficacy of Fiscal Stimulus in a Depressed Economy Are Based on As-Flimsy Evidence as the Laffer Curve?! Seriously False Equivalence.” Working Economics (Economic Policy Institute blog), June 7, 2012. Bivens, Josh. 2012b. Public Investment: The Next ‘New Thing’ for Powering Economic Growth. Economic Policy Institute Briefing Paper no. 338. Bivens, Josh. 2014. Nowhere Close: The Long March from Here to Full Employment. Economic Policy Institute, March 2014. Bivens, Josh. 2015. A Vital Dashboard Indicator for Monetary Policy: Nominal Wage Targets. Policy Futures project, Center on Budget and Policy Priorities, June 2015. Bivens, Josh. 2016a. Mission Still Not Accomplished: To Reach Full Employment We Need to Move Fiscal Policy from Austerity to Stimulus. Economic Policy Institute, March 2016. Bivens, Josh. 2016b. Why Is Recovery Taking So Long—and Who’s to Blame? Economic Policy Institute, August 2016. Bivens, Josh. 2017a. A ‘High-Pressure Economy’ Can Help Boost Productivity and Provide Even More ‘Room to Run’ for the Recovery. Economic Policy Institute, March 2017. Bivens, Josh. 2017b. Inequality Is Slowing US Economic Growth: Faster Wage Growth for Low- and Middle-Wage Workers Is the Solution. Economic Policy Institute, December 2017. Bivens, Josh, and Hunter Blair. 2017. ‘Competitive’ Distractions: Cutting Corporate Tax Rates Will Not Create Jobs or Boost Incomes for the Vast Majority of American Families. Economic Policy Institute, May 2017. Bivens, Josh, and Hunter Blair. 2018. “The Likely Economic Effects of the Tax Cuts and Jobs Act (TCJA): Higher Incomes for the Top, No Discernible Effect on Wage Growth for Typical American Workers.” Testimony submitted to the Committee on Ways and Means Tax Policy Subcommittee, U.S. House of Representatives, June 1, 2018. Bivens, Josh, and Andrew Fieldhouse. 2012. A Fiscal Obstacle Course, Not a Cliff: Economic Impacts of Expiring Tax Cuts and Impending Spending Cuts, and Policy Recommendations. Economic Policy Institute and The Century Foundation, Issue Brief no. 338. Bivens, Josh, Andrew Fieldhouse, and Heidi Shierholz. 2013. From Free-Fall to Stagnation: Five Years after the Start of the Great Recession, Extraordinary Policy Measures Are Still Needed, but Are Not Forthcoming. Economic Policy Institute Briefing Paper no. 355. Blair, Hunter. 2016. ‘The People’s Budget’: Analysis of the Congressional Progressive Caucus Budget for Fiscal Year 2017. Economic Policy Institute Policy Center, March 2016. Blair, Hunter. 2017. ‘The People’s Budget’: Analysis of the Congressional Progressive Caucus Budget for Fiscal Year 2018. Economic Policy Institute Policy Center, March 2017. Bureau of Labor Statistics (BLS). 2018a. “Series ID: LNS11300000. (Seas) Labor Force Participation Rate.” Public data series aggregated from basic monthly CPS microdata. Series report accessed July 10, 2018. Bureau of Labor Statistics (BLS). 2018b. “Series ID: LNS12300060. (Seas) Employment-Population Ratio — 25–54 yrs.” Public data series aggregated from basic monthly CPS microdata. Series report accessed July 10, 2018. Bureau of Labor Statistics (BLS). 2018c. “Series ID: LNS14000000. (Seas) Unemployment Rate.” Public data series aggregated from basic monthly CPS microdata. Series report accessed July 10, 2018. Bureau of Labor Statistics (BLS). 2018d. “Table A-15. Alternative Measures of Labor Utilization” (Economic News Release). Last modified July 6, 2018. Congressional Budget Office (CBO). 2012. Estimated Impact of the American Recovery and Reinvestment Act on Employment and Economic Output from January 2012 through March 2012. May 2012. Congressional Budget Office (CBO). 2018a. An Analysis of the President’s 2019 Budget. May 2018. Congressional Budget Office (CBO). 2018b. The Budget and Economic Outlook: 2018 to 2028. April 2018. Council of Economic Advisers (CEA). 2011. The Economic Impact of the American Recovery and Reinvestment Act of 2009: Eighth Quarterly Report. December 2011. DeLong, Brad, Larry Summers, and Laurence Ball. 2014. Fiscal Policy and Full Employment. Center on Budget and Policy Priorities, April 2014. Fieldhouse, Andrew. 2011. “The People’s Budget: A Technical Analysis.” Economic Policy Institute Policy Center, Working Paper no. 290, April 2011. Fieldhouse, Andrew, and Rebecca Thiess. 2012. The Budget for All: A Technical Report on the Congressional Progressive Caucus Budget for Fiscal Year 2013. Economic Policy Institute Policy Center, March 2012. Fieldhouse, Andrew, and Rebecca Thiess. 2013. The ‘Back to Work’ Budget: Analysis of the Congressional Progressive Caucus Budget for Fiscal Year 2014. Economic Policy Institute Policy Center, March 2013. Hungerford, Thomas. 2015. The ‘People’s Budget’: Analysis of the Congressional Progressive Caucus Budget for Fiscal Year 2016. Economic Policy Institute Policy Center, March 2015.
International Monetary Fund (IMF). 2012. World Economic Outlook, October 2012: Coping with High Debt and Sluggish Growth. October 2012. Office of Management and Budget (OMB). 2018. Efficient, Effective, Accountable: An American Budget, Fiscal Year 2019. Office of Management and Budget (OMB). n.d. “Table 2.3—Receipts by Source as Percentage of GDP: 1934–2023.” Downloadable from Historical Tables. Organisation for Economic Co-operation and Development (OECD). n.d. Revenue Statistics—OECD Countries: Comparative Tables. OECD.Stat. Smith, Joshua. 2014a. The ‘Better Off Budget’: Analysis of the Congressional Progressive Caucus Budget for Fiscal Year 2015. Economic Policy Institute Policy Center, March 2014. Smith, Joshua. 2014b. Five Years since the American Recovery and Reinvestment Act: The Downward Spiral of Public Investment. Economic Policy Institute, February 2014. Zandi, Mark. 2011. “At Last, the U.S. Begins a Serious Fiscal Debate.” Moody’s Analytics, April 14, 2011. Note: Figures are for fiscal years. Numbers may not add due to rounding. 14,665 15,789 16,550 16,987 17,543 18,183 18,807 19,365 20,007 20,585 21,129 21,820 n.a. n.a. a. The revenues and outlays of the Social Security trust funds and the net cash flow of the Postal Service are classified as off-budget. Note: Figures are for fiscal years. 76.47% 78.54% 78.30% 77.10% 76.70% 76.67% 76.38% 75.70% 75.23% 74.56% 73.68% 73.22% n.a. n.a. 0 113 -193 -816 -1,427 -2,107 -2,802 -3,538 -4,303 -5,101 -5,929 -6,822 n.a. n.a. 0 0.56% -0.91% -3.71% -6.24% -8.89% -11.38% -13.83% -16.18% -18.48% -20.67% -22.89% n.a. n.a. 76.47% 78.54% 78.30% 77.09% 76.69% 76.66% 76.38% 75.69% 75.22% 74.56% 73.68% 73.21% n.a. n.a. 76.47% 77.98% 79.21% 80.80% 82.94% 85.55% 87.76% 89.53% 91.41% 93.04% 94.35% 96.11% n.a. n.a.